When you engage us or sign up for any of q-products Europe group services, including our calls, newsletters, bulletins, seminars and other events and communications, or when you use our Website, we may collect and process your name, address, telephone number and email address and other information about you from which you can be identified (collectively, “Personal Data”). We will store and use your Personal Data for purposes of administering and maintaining our relationship with you and providing services or information to you as instructed by you or as otherwise allowed by applicable law. We may separately contact you for the purpose of providing you with other information which we believe may be of interest to you. However, we will not initiate such contacts with you solely as a result of your having accessed our Website, unless you have affirmatively given your consent to such contacts during one of your visits to our Website. Also, where applicable under local laws, we will not use Personal Data for marketing purposes unless we have obtained your prior consent. Legitimate Interests – We may Process your Personal Data where we have a legitimate interest in such processing for managing, operating or promoting our business, and that legitimate interest is not overridden by your interests, fundamental rights or freedoms. Consent – We may process your Personal Data where we have obtained your consent to the processing. Contractual Necessity – We may process your Personal Data where such processing is necessary in connection with any contract we have with you. Legal Requirements – We may process your Personal Data where such processing is required by applicable law. If you wish, you can adjust your browser so that your computer does not accept cookies: 1. Go to the heading "Manage Cookies" and click onto the option you prefer, either stopping cookies being installed, or notifying you of them; and 2. From the list provided, click onto the program which your computer uses; if this is not shown on the list, click on the "help" heading on the bar at the top of the page, search for information on "cookies" − an explanation of how to delete cookies will appear, then follow the instructions. Alternatively, you can adjust your browser to tell you when a website tries to put a cookie on your computer. How you adjust your browser (to stop it accepting cookies or to notify you of them) will depend on the type of internet browser program your computer uses. You can follow the appropriate instructions for your specific browser type by clicking onto this link: www.aboutcookies.org/how-to-control-cookies/ (please note that this link will open a new window and will lead to an external website and that we are not responsible for the content of external websites). Users based in the European Union can visit http://www.youronlinechoices.eu/ to opt out of these third party cookies. The foregoing website is not connected to us and we are not responsible for its content. We only keep cookies for the duration of your visit to the Website, except in the case of cookies which remember you for future visits or where you save your login name as referred to above. If you wish to find out more about cookies, please click on this link: http://www.allaboutcookies.org (please note that this link will open a new window and will lead to an external website and that we are not responsible for the content of external websites). Cookies do not contain confidential information such as your home address, telephone number or credit card details. If you do choose to disable cookies, you may find that certain sections or functions of our Website may be impaired or may not work properly. q-products Enterprise Limited has policies and technical and organizational measures in place which are intended to safeguard and protect your Personal Data against unauthorized access, accidental loss, improper use and disclosure. However, you should be aware that when data is transmitted over the internet it is not completely secure because of the nature of the internet and that systems and measures used to secure data are not flawless. For these reasons, although we will use reasonable efforts to protect your Personal Data, we do not warrant the security of Personal Data transmitted to us or stored by us, and Personal Data that is transmitted to us by you electronically is done at your own risk. Our policy is to retain your Personal Data only for as long as is necessary to fulfill the purposes for which we collected such Personal Data, including for the purposes of satisfying any professional, legal, accounting or reporting requirements to which we are subject. To determine the appropriate retention period for Personal Data, we consider the scope, nature and sensitivity of the Personal Data, the potential risk of harm from unauthorized use or disclosure of the Personal Data, the purposes for which we collected and process your Personal Data and whether we can achieve those purposes through other means, and any applicable legal and professional requirements. If you are a citizen of the European Union, you have a number of rights concerning your Personal Data that we hold and use, including the following: Right of Access – You have the right to be informed about what Personal Data we hold about you and to a copy of this Personal Data. Right to Rectification – You have the right to have any inaccurate Personal Data which we hold about you updated or corrected. Right to Erasure – In certain circumstances you may request that we delete the Personal Data that we hold on you. Right to Complain – You have the right to lodge a complaint regarding the processing of your Personal Data to an applicable governmental or supervisory authority in your country. Right to Withdraw Consent – Where processing of Personal Data is based on your consent, you have the right to withdraw such consent at any time. Right to Object – Where we rely on our legitimate interests to process your Personal Data, you have the right to object to such use and we are required to discontinue such processing unless we can demonstrate an overriding legitimate interest in such processing. Right to Restriction – You have the right to request that we stop using your Personal Data in certain circumstances including if you believe that the Personal Data we hold about you is inaccurate or that our use of your Personal Data is unlawful. If you validly exercise this right, we will store your Personal Data and will not carry out any other processing until the issue is resolved. 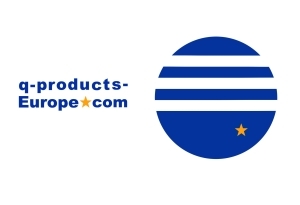 You may exercise any of the above requests in writing and addressed to info [at] q-products-europe.com. In addition, all recipients of marketing communications from us are free at any time to request that we stop using your Personal Data for marketing purposes, by contacting our Marketing Department at info [at] q-products-europe.com. Dipl.-Ing (FH) Michael Schoening in England offices is designated as our Data Protection Officer in the European Union and his email address is m.schoening [at] q-products-europe.com. He is also our designated representative for German privacy-related matters not otherwise covered under the European Union’s General Data Protection Regulation.